We don’t do afternoon talks because our nursery is open. Fee for 2020 will be £70 – £110 + travelling cost. My name is Kevin Pratt. I’ve been a garden speaker for over thirty five years. I give almost 50 talks a year to gardening clubs in the UK. With a number of keynote talks, Hardy Plant AGM (Twice) Leeds and Glasgow. Cottage Garden Society AGM Wales and more recently Stachyurus speech addressing the RHS Hardy Plant Committee Vincent Sq. London in 2011 and 5 days of lectures for the R.H.S. Tatton Flower Show 2017 and again in 2018. I was Self employed a hands on gardener for 30 years. I have Two RHS GOLD medals, floral marquee 2004, 2006 and a Gold medal at Southport show 2008. I am highly qualified in Horticulture with subjects studied, Soil science, Botany and Horticulture. I have written many articles and have a hard back book with David and Charles. “The gardeners guide to Fritillaries.” I am in the process of writing “Stachyurus” and I’ve held two national collections in the past, Fritillaria and Eucomis. One or more of the collections have featured in The RHS Garden magazine, Amateur Gardening, Chelsea flower show , RHS Hall Vincent Sq. Tatton flower show, Southport flower show and many other smaller shows with two television appearances. I grow a large collection of Rare plants, trees, shrubs, with a particular favor towards woddies (Trees) Alnus, Sorbus, Stachyurus, Betula, but I still like Bulbs, Fritillaria, Polygonatum, Arisaema, and Gesneriads and we sell over 1000 plants from our plant nursery, all in my 30ft x 30ft back garden. At my talks I always bring rare plants for sale, these are propagated in my small nursery. Village Plants Nursery was open to the public in July 2015, I am now able to sell some really unusual hardy plants that have been grown here in the North West U.K.
I’m a member of the RHS, HTA, AGS, NCCPG, NARGS, SRGC, HPS. Hardy orchid society, Gesneriad society, Fritillaria society and Fern society. I use my own digital projector and all of my talks are on a computer. If you can supply a large screen, it helps, (very bulky in my car.) I like to sell a selection of rare plants that I have grown here in my garden, so a spare sales table would also be helpful. I don’t mind offering a plant free of charge for your Raffle but I can’t afford to give a percentage of the profits. Thank you for considering me as a speaker today if you have enjoyed my talk please consider another talk from my list. ********Southport AGS Joan Vincent. Thank you very much for leaving your nursery to visit us. We all enjoyed the lovely photographs of your unusual bulbs-yet the special part your invaluable advice on the best way to achieve success with these and other plants. Once again your real hands-on experience shone through and I think we all feel we cannot do better than follow your soil recipes and methods. *******Allestree Garden Club. Your Talk was very much enjoyed by the members. I keep getting stopped at the local shops by members wanting to tell me how they liked it. And many of them will have a permanent memory of the unusual plants. No doubt they will be proudly displayed at our next open gardens. *******Exeter, Devon AGS ‘Lorraine (Chris) Birchall. We thought your talk was very informative, interesting and we loved the sprinkling of humour throughout the evening. All Talks are digital. Each talk lasts about one hour. You can be assured I DO NOT talk on and on over the one hour! A mix of unusual strange flowering plants and a few plants people may like try to grow. All the plants grow in my garden in Stockport. Arisaema, Helwingia, Fritillaria, Stachyurus, Lysionotus, Eucomis etc. Covering bulbs, climbers, herbaceous shrubs and trees. A general look at 50 easy garden Fritillaria. I feel this subject is best mixed with another half talk, unless you are a specialist group. I still have 35 different Fritillaria growing outside in my garden. We had one of the largest collections of Poppies in Europe. We grew and held seed from 65 varieties which we sold at the RHS flower shows, under the name Poppy Heads Ltd. This talk covers 100 poppies from alpines to 2m (6ft) giant poppies. A talk full of very pretty flowers. All the plants shown have grown in my garden in Stockport. A good general plant talk where I show you how to grow the plants. This talk is packed full of advice. 7. Winter Talk. Don’t Go To Sleep During Winter. My new written talk, new pictures and new subject. Winter plant colour. What you can be doing in winter and where to visit to see colour. Advice, plants and preparation. A mix of unusual flowering bulbs and a few bulbs people may like try to grow. All the plants grow in my garden in Stockport. A list of a few bulbs would be, Arisaema, Eucomis, Fritillaria, Crocus, Polygonatum, Allium, Arisaema, Puschkinia, Corydalis. Bulbs are not just for spring, they are planted for all-year-round colour. This is Talk covering the full year January to December. Colour from bulbs all year. 10. Flower hunting in Portugal. A talk about the wildflowers of Portugal. which concludes in the many beautiful Orchids. Portugal is well known for beautiful wild flowers and Orchids, I have visited Portugal over twenty times and have traveled and photographed 1000 wild flowers. Surprisingly, Many of these plants you can grow in your own garden. 11. Woody Plants That Merit Attention. 12. A question of Soil Fertility. A demonstration and ideal for an AGM. Half hour chat about Soil which is the back bone of plants. I ask, What makes plants grow ? How much should we feed ? what fertilizers ? What is wrong with our / your soil? As a member of the Alpine Garden Society for over 30 yrs, Local Committee member for 20yrs and local Alpine Chairman for 4 yrs, I have a collection of fantastic Alpine pictures. This is a talk about how I become addicted to growing alpines. 14. My Garden, A Plantsman’s Garden. This talk is about the rare plants I have been growing for over thirty years. I have grown over 10,000 different plants. I look at the success the failures and my obsession for collecting obscure plants . My research hobby on the life and work of my relativeand plant explorer Antwerp Pratt. He was an explorer from 1880-1920 living on The Isle of Wight he collected and traveled the world. Although he collected plants, insects and Butterflies in China and New Guinea, his detailed description of his travels in China was used by E.H. Wilson. I have the most detailed research into this fascinating person. 16. Growing Gesneriads. Petrocosmea, Ramonda. A bus man’s hobby. 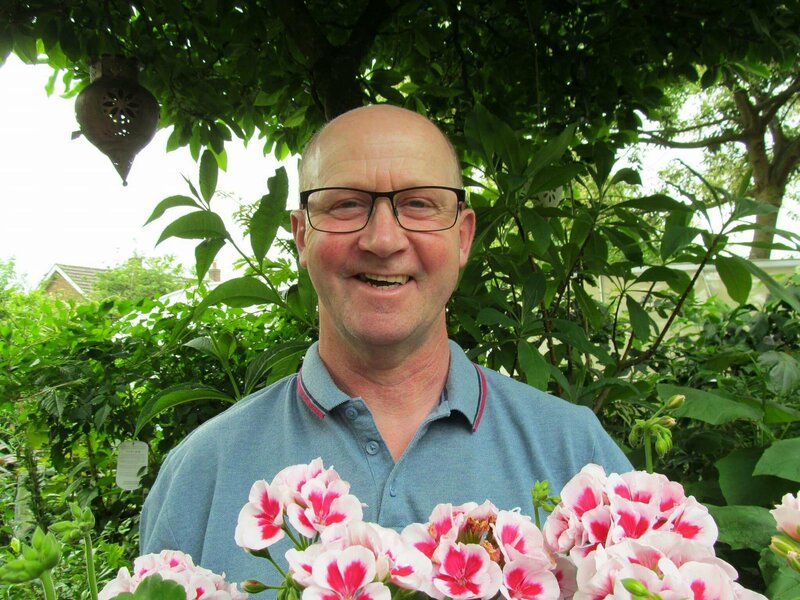 This talk covers my hobby for growing the challenging plants in the Gesneriad family. This talk covers soil, growing conditions and many species of the Gesneriad family, like Ramonda and Petrocosmea. This was the key note talk I gave to the RHS Hardy Plant Committee in 2011. It covers the species of Stachyurus, cultivation and origin. A specialist talk but can be picked with another talk and made more general. I Try to have a few Stachyurus plants for sale on the day of the talk. I love orchids and I have a special interest towards Epipactis and Dactylorhiza hardy outside in the garden. I work with the local Cheshire trust in the Orchid Fields, counting orchids. To find Village Plants. Hazel Grove, A6. / Asda traffic lights, turn down commercial Road past Marks and Spencers, past Hazeldines Butchers. / continue for 100 yards, DIY shop we are opposite the DIY shop. You will see a large sign on the wall of our house and an ‘A’ board on the path. Village Plants.